Key Concept: Numbers and statistics in a real-life context. DESCRIPTION FROM THE PUBLISHER: This is the new paperback edition of a beautiful and unique book, which explains facts about the world’s population in a simple and fascinating way. 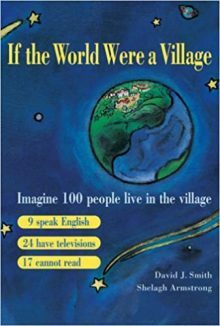 Instead of unimaginable billions, it presents the whole world as a village of just 100 people. We soon find out that 22 speak a Chinese dialect and that 17 cannot read or write. We also discover the people’s religions, their education, their standard of living, and much much more…This book provokes thought and elicits questions. It cannot fail to inspire children’s interest in world geography, citizenship and different customs and cultures, whether they read it at home or at school.